He didn’t, and now he is well on his way to finding the life and career he wants, which includes pursuing an engineering degree at Western Washington University (WWU). When he dropped out of high school in 1999, Justin didn't believe he would ever be able to go to college. And when he completed his GED in 2003, he thought he was completely finished with going to school. He joined the military and spent seven years in the Army National Guard, including combat time in Iraq, which left him with Post-Traumatic Stress Disorder (PTSD). He credits Peninsula College with giving him the opportunity to re-integrate into the civilian world after his military service. “After my combat time in Iraq I was suffering from PTSD and being around people and loud noises was a serious issue for me,” he says. But with the help of Peninsula College staff, mental health therapy and exposure to people and the welding environment, he has made huge strides in dealing with it. “I am now able to work well with other people in a normal and professional atmosphere as well as work in the loud welding shop without having serious PTSD-invoked reactions to things in the shop,” he says. When he started at Peninsula College, Justin didn't have any goals in mind other than getting his degree and going to work. “I decided to take the welding program after realizing that I couldn't find any suitable work around the peninsula for my particular set of skills, straight out of the military. Welding seemed like a great opportunity to learn a valuable skill that I could use anywhere in the world. It also fit into my previous work experience of manufacturing and construction. “Since my time here,” Justin continues, “I have decided that I really enjoy the school environment, and I am going to continue my education.” His next stop is Whatcom Community College in Bellingham where he plans to start an engineering degree that will transfer to WWU. Justin will take an impressive academic and extra-curricular resume with him. In May 2014, he was inducted into Peninsula College’s Beta Delta Nu Chapter of the Phi Theta Kappa International Honor Society, the official honor society for two-year colleges. He is the former Director of Administrative Affairs with the Associated Student Council and was previously the club’s director. He has also served as secretary for the Peninsula College Veterans' Club, is a former vice president of the Welding Club and was a member of the Peninsula College Rainbow Alliance. In addition, for most of his two years at Peninsula College, he was an employee of the Bookaneer bookstore and did work-study for the Welding program. His advice to others is simple and direct: “Education is so dependent on the effort that you put into it, and nothing is ever going to be handed to you,” he says. “Put in the work, be steadfast in studies, and the benefits will be abundant. 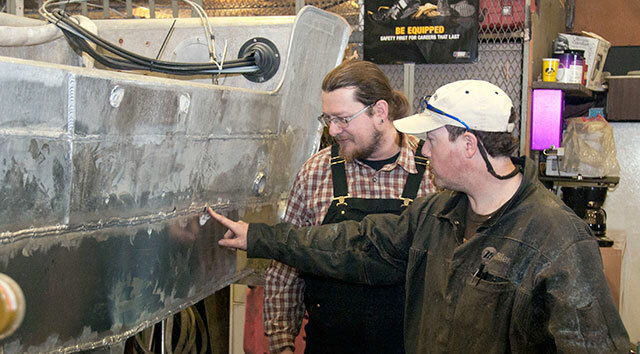 Justin and welding instructor Eoin Doherty talk about the finer points of welding. Justin and his wife, Lacey, are now in Bellingham. Lacey, who also graduated from Peninsula College in June 2014 plans to pursue a degree in gender studies at WWU. 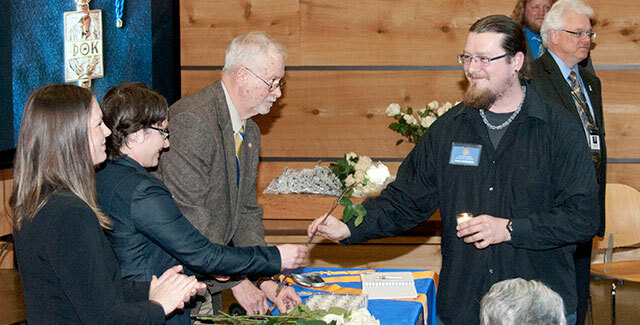 Justin, front right, receives congratulations after being inducted into Peninsula College’s Beta Delta Nu Chapter of the Phi Theta Kappa International Honor Society.